Flambeau Trail System (70 miles) ~ OPEN May 1 through March 15 – Report date 12/27/18 – OHV trails are open until spring break up, and everything should be pretty firm from the cold temps. There is very little snow on the ground. Trail manager – Chequamegon-Nicolet National Forest – 715-762-2461. Georgetown Trail (15.8 miles) ~ OPEN May 1 through March 14 – Report date 12/27/18 – The Georgetown Trail is in good condition for ATV, UTV and Off-road Motorcycle riding. Trail manager – Price County Forestry & Parks Department – 715-339-6371. Pine Line / Price-Taylor Rail Trail/Prentice Area ~ CLOSED – The Price County section of the trail allows ATV and UTV use December through March 31 when snowmobile trails are officially open and the temperature is 28 degrees or colder. The Price County region of Wisconsin welcomes motorized vehicle enthusiasts to enjoy hundreds of miles of trail riding opportunities, events and the best in Northwoods hospitality. There are four trail systems in the county that are open spring through fall including 62-miles of the Tuscobia State Trail, the 70-mile Flambeau Trail System, the 9.5-mile Solberg Trail, and the 15.8-mile Georgetown Trail. Via the Tuscobia State Trail one can access the 38-mile Flambeau River State Forest Trail and the 56-mile Dead Horse Run Trail, both in neighboring Sawyer County. During the winter months, riders can use the Flambeau Trail System, Solberg, Georgetown, and the Pine Line Rail Trail with access to Timm’s Hill, Wisconsin’s highest geographical point, via club snowmobile trails with temperature restrictions enforced on some trails. Motorized vehicles are permitted to operate on designated streets in several communities allowing direct trail access to lodging, camping, restaurants, fuel and other services. Park Falls Wisconsin serves as the trailhead for the Tuscobia State Trail, an abandoned railroad grade that offers ATV and UTV use on a 62-mile stretch from Park Falls west to Birchwood. Traveling along the multi-use trail you will encounter a variety of scenery from wooded sections to open farmland. The Park Falls-Tuscobia Trailhead County Park is the perfect location to begin your journey with ample 24-hour parking, a loading ramp, picnic area, pavilion, grills, and a flush toilet building that is open from mid-April to mid-October. The park is located 1 mile west of Park Falls off of County Road E. There is also trail access to the Tuscobia State Trail from Smith Lake County Park & Campground located 2 miles west of Park Falls off of County E at Omaha Road. At Smith Lake County Park & Campground there is ample parking, a loading ramp, pavilion, picnic tables, grills, fire rings, electricity, plus pressure water, flush toilets and a shower building which are operable mid-April thru mid-October. Along the trail you will find lodging, camping, restaurants, fuel and other services. The trail is open for use on the eastern 10 miles from April 16 to November 14 and west of Price County on 52 miles from December 10 – November 14. Park Falls and Fifield, as well as the Pike-Round Lake area of Wisconsin, serve as the system trailheads for the Flambeau Trail System, a 70-mile trail that winds through the Chequamegon-Nicolet National Forest. This multi-use trail is developed for riding ATVs, UTVs and dirt bikes/motorcycles, mountain bikes, horses, hiking, snowshoeing, and snowmobiles. The trail features rolling terrain, tree-lined corridors and several points of interest including the Smith Rapids Covered Bridge, Sailor Lake Campground , Round Lake Logging Dam, and Camp Nine Springs. The trail allows access to the city of Park Falls and connects to the Tuscobia State Trail. The trail is open for motorized use May 1 thru March 14. There is parking with trail access in Park Falls and at several access points in between. Along the trail you will find lodging, camping, restaurants, fuel and other services. The 9.5-mile Solberg Trail connects to the Flambeau Trail System at Sailor Lake Campground. This multi-use trail is developed for riding ATVs, UTVs, off-road motorcycles, mountain bikes, horses, hiking, and snowshoeing. The trail has a graveled surface, crosses numerous wooden boardwalks and meanders through a variety of different forest types. The trail is open for motorized use May 1 thru March 14. There is parking with a loading ramp and trail access about 6 miles northeast of Phillips on East Solberg Lake Road, at Solberg Lake Campground, where you can ride from your campsite, and from area businesses. Along the trail you will find lodging, camping, restaurants, and other services. The Georgetown Trail is located on the Price County Forest west of Phillips, Wisconsin. The trail is 15.8 miles long with a gravel surface and meanders through a variety of forest types. There are no amenities at either of the parking areas or along the trail; however, there is road route access to businesses on both ends of the trail. The north parking area is located west of Phillips on Carpenter Creek Road. From Hwy. 13 in Phillips go 10 miles west on County Hwy. W and then about 1 mile south on Carpenter Creek Road. The south parking area is located on Fairview Road north of Kennan. From U.S. Hwy. 8 and County Hwy. J intersection, go west on U.S. Hwy 8 approximately 2 miles to Fairview Road, then north 3 miles on Fairview Road to the parking area. There is access to restaurants/taverns at the south end of the trail, but fuel is not available. The trail is open for motorized use May 15 thru November 15. The southeastern portion of Price County offers riders the Pine Line Rail Trail. The 26 miles of trail takes ATV, UTV, and snowmobile riders through scenic terrain between Prentice in Price County and Medford in Taylor County. The Pine Line Rail Trail is open to ATV & UTV use when the trail is open to snowmobiles, typically from Mid-December to March 31. Timm’s Hill, the highest geographical point in the state, can be accessed by snowmobile trail 189. Temperatures must be 28º F or colder to ride ATVs or UTVs on the trail. Parking and services are available in Prentice. West of Park Falls, in Sawyer County, you will find the 38-mile Flambeau River State Forest Trail consisting of snowmobile routes, forest roads and town roads. The Flambeau River State Forest trail system can be accessed from Park Falls by taking the Tuscobia State Trail west for 13 miles and then heading south. The trail is open for ATV & UTV use May 15 thru November 15. Limited services are available along the trail. 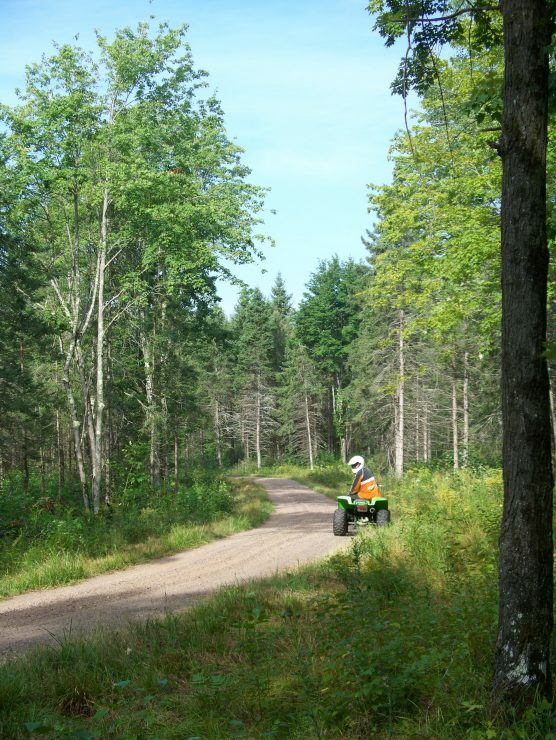 West of Park Falls Wisconsin, in Sawyer and Ashland counties, you will find the 56-mile Dead Horse Run ATV, UTV and Off-Road Motorcycle Trail winds through the Chequamegon-Nicolet National Forest. The Dead Horse Run Trail can be accessed from Park Falls by taking the Tuscobia State Trail west for 13 miles and then heading north. Facilities along the trail system are limited to parking, and riders are advised to be prepared with ample supplies prior to entering the trail system. The trail is open for ATV, UTV, and Off-road Motorcycle and dirt bike use May 1 thru March 14. 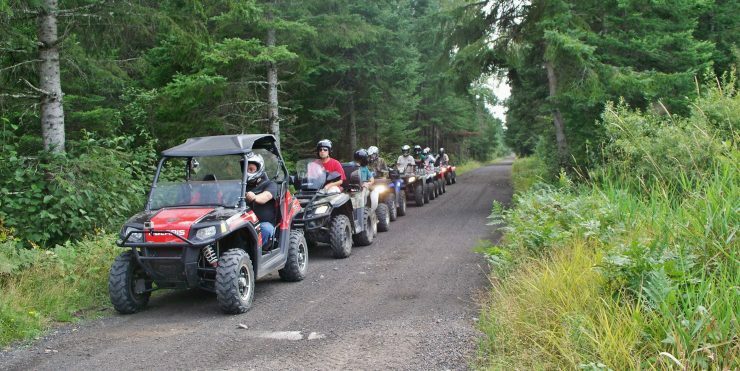 With over 180 miles of scenic trails and businesses dedicated to serving the ATV travelers’ needs, the Price County Wisconsin region is definitely a great choice for the off-road rider!